South Africa head coach Allister Coetzee has named Francois Hougaard on the wing in his Rugby Championship team to play Australia’s Wallabies in Brisbane on Saturday. The former Bulls winger/scrumhalf comes into the side as replacement for Ruan Combrinck who was injured in the Springboks loss to Argentina in Salta. His promotion to the starting line up sees Bryan Habana moving from left wing to right wing. Hougaard missed most of the 2016 Super Rugby season as he was part of the Springbok Sevens squad and also played at scrumhalf for Worcester Warriors in England. The winger missed the opening rounds of the Rugby Championship as he was in Rio for the Olympics where he won a Bronze medal for finishing third in Sevens. In other changes to the backline Jesse Kriel comes in for Lionel Mapoe while Hougaard’s fellow Olympic Sevens partner Juan de Jongh comes into the starting line up replacing Damien de Allende. The starting forward pack has been retained from the loss to Argentina with the exception of Vincent Koch who has been replaced by Lourens Adriaanse. Springbok coach Allister Coetzee said he is excited to see what impact the new players in the team can make in what will be a big challenge on Saturday. “Looking at the impact that Juan and Jesse made when they came off the bench in Nelspruit and Salta, then I think now is the right time to give them a starting opportunity,” said Springbok coach Allister Coetzee. Coetzee reckons the Springboks will benefit from the versatility of Hougaard, who has already played in 35 Tests for the Springboks. “Francois covers two positions for us, on the wing and scrumhalf and apart from that he has other good attributes,” said Coetzee. 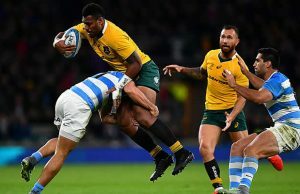 Coetzee also said the ability of Australia to hold on to the ball through long spells means the Springbok defence will have to be patient and solid. “The Wallabies are known for their ability to hold onto the ball for long phases, so we are preparing ourselves to make a lot of tackles and to be organised on defence,” said Coetzee, who added that he is expecting the players on the bench to yet again make a strong impact. The Bookmakers have Australia to beat South Africa the Rugby Championship by 5 points.